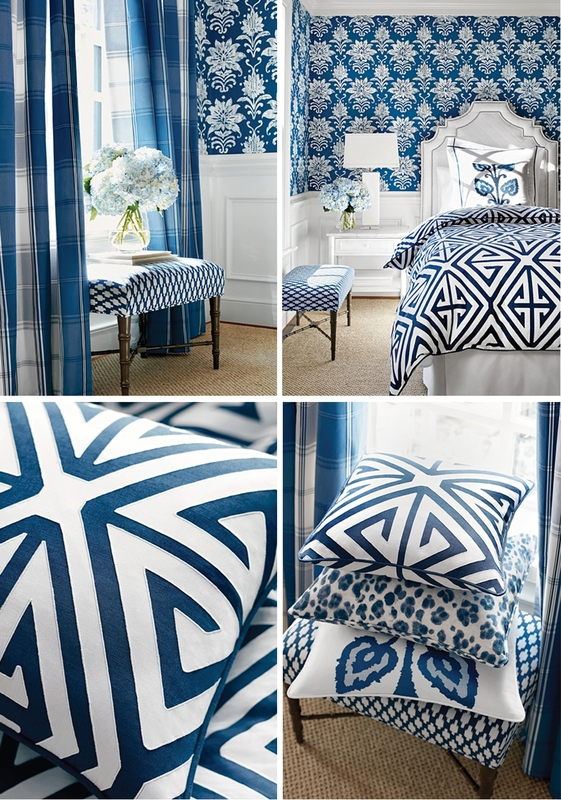 Thibaut has just released their stunning new Bridgehampton collection that is now available at The Quiet Moose. This is a collection of peppy and spirited traditional patterns inspired by the fashionable beach community in New York. They have incorporated upbeat and lively designs into this coordinated collection of wallpapers and print, woven, and embroidered fabrics. The collection features crafty florals, textural paper weaves, an on-trend animal print, and graphic patterns in both large and small scales. 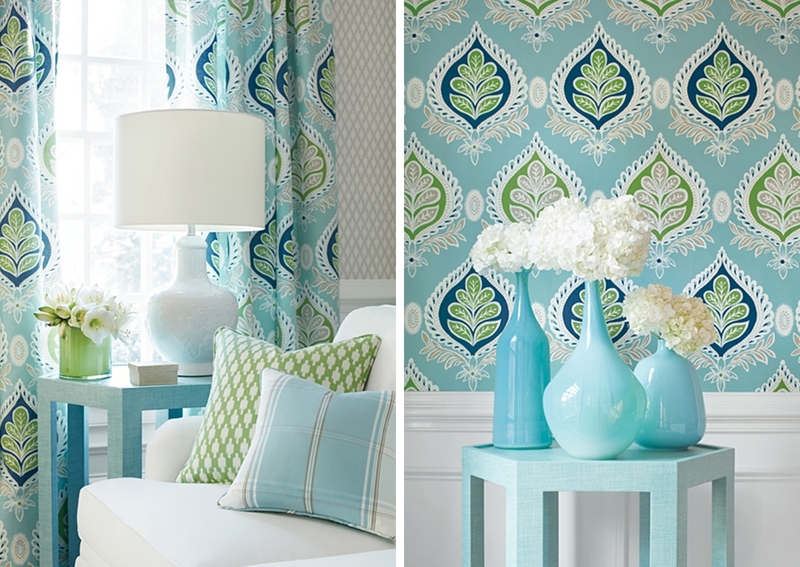 Although the patterns are traditional, they have been given a contemporary edge with their fresh color palette. This serene bedroom features Basketry, a slightly textured and wonderfully detailed wallpaper that adds instant warmth and dimension to any room. Peacock Garden features wild birds in vibrant hues, perched on tree vines. This pattern has been designed in fresh colorways like navy and beige, aqua and green, and brights on white. The Melrose Chair is looking fierce in the watercolor leopard print Panthera. This chair is perfectly sized for a desk, hall, bedroom or vanity table. The Demetrius Appliqué is a large-scale geometric pattern. The color contrasts add a nice modern edge to the room. With its comfortable arms and updated styling, the Kendall Sofa is a great focal point. Here it is accented by the elegance of the Bridgehampton collection of coordinated wallpaper, printed, woven, and embroidered fabrics. The soft and soothing blue and green color combination is perfection. Midland adds a soothing pop of color to rooms that feature a more neutral backdrop. It’s perfect for creating a relaxed and calming environment. 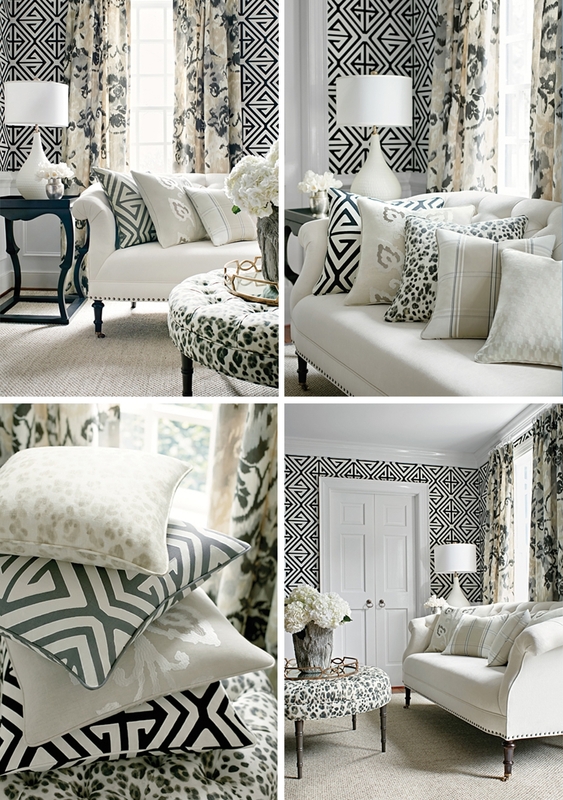 One of our favorite color stories in the new Bridgehampton collection is the classic black and white! Shown here is Panthera, a lively leopard print wallpaper, and the Salem Wing Chair stuns in Demetrius Appliqué. This large, stylized jacobean wallpaper and fabric features crafty-looking flowers and gorgeous intricate details. The New England Plaid is a versatile cotton/poly fabric and can be used for pillows, drapes, or light upholstery, and the colorways are bright and fun! 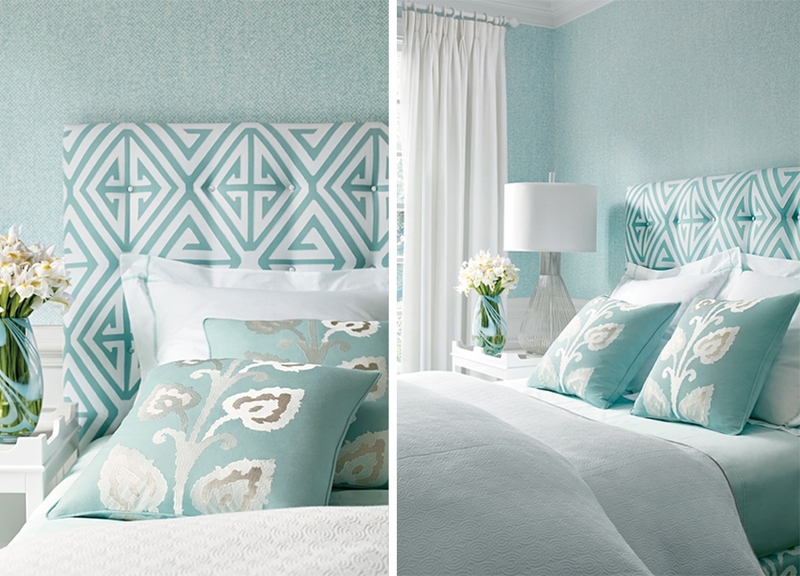 Beautiful in a bedroom, the large-scale damask motifs in Tanglewood look like they are carved out wooden block prints. A subtle background strie gives this wallpaper depth and interest. Rendered in soft and dusty hues it’s a perfect punch of color to add a little romance to the room. 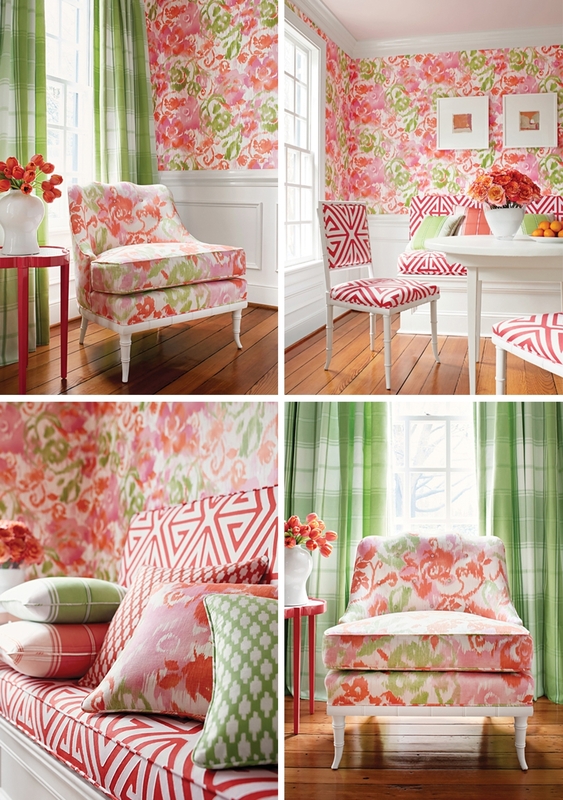 Waterford Floral is pretty in pink displaying a watercolor floral pattern that has soft, ikat-like effects. This divine breakfast nook has the ultimate spring color palette and the Brentwood chair’s graceful curves and petite frame allow it to fit anywhere. We’re ready for Spring and our new showroom collections say it all! Spring into The Quiet Moose to browse all of our collections. If you can’t wait, browse our newest arrivals here.